Photo: West Midlands Fire Service. Britain’s infrastructure manager, Network Rail, has launched a campaign to tackle the rising number – and rising cost – of collisions between lorries and railway bridges. The number of bridge strikes was at its highest level for five years in 2017 and Network Rail estimates a total annual cost of more than £23 million. Through its new campaign ‘Lorries Can’t Limbo’, Network Rail hopes to educate HGV drivers about the risk posed by low bridges. There are around 2,000 bridge strikes reported every year. These incidents often result in delays and closures while the bridge is inspected for damage. Mark Wheel, senior engineer at Network Rail, said: “Day to day, HGV drivers and decision-makers have to address different demands or distractions. We know that bridge strikes are a pertinent issue for a majority of drivers and decision-makers. “However, there are many other challenges which often appear more immediate. 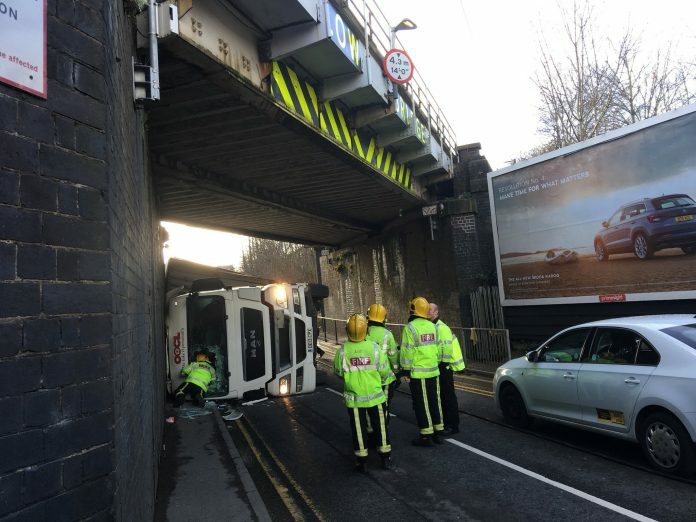 Bridge strikes are not always ‘front and centre’ and drivers often need to be challenged to consider them, especially outside the confines of their regular depots or destinations. “We have worked across the industry to develop a campaign together with our partners, using their knowledge and expertise about their audience. Rather than alienate drivers the campaign aims to be collaborative.